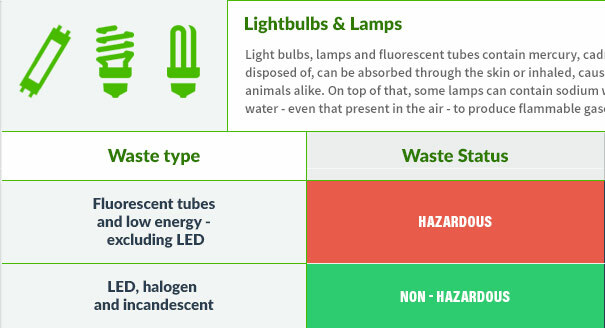 Fluorescent tubes are now classified as hazardous waste in our country, and – as such – need extra care and attention when being disposed of. To take the daunting task of disposing of these hazardous materials off your hands, the honest, hardworking team here at Envirocraft are fully equipped in the safe disposal of fluorescent tube recycling, working in an efficient manner and bringing with them a friendly working environment. At our base in Byley, set in the rolling Cheshire countryside, our professional team tackle each job with a friendly and committed approach. With our flexible transport fleet and array of additional hubs scattered around the country, we can reach your premises no matter where you may be. Whatever the size of your project, we will take the work in our stride and provide you with the service you need at an affordable price, bringing not only hard work but a cheerful manner. For more information on our services, and for your no-obligation, free quote, contact the team at Envirocraft today and let us help the environment whilst helping you and your business.